Earth’s climate system is influenced strongly by ocean currents that are located both at the surface, as well as in deep water below 1000m. Warm surface currents carry less dense water away from the Equator toward the poles, and cold deep currents carry denser water away from the poles. 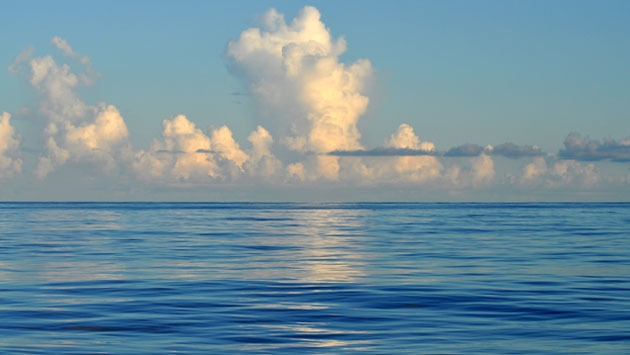 In this manner, ocean currents distribute heat energy and play a large role in regulating Earth’s weather and climate, in addition to cycling nutrients, salt, and gases such as carbon. One of the largest oceanic systems is the Atlantic Meridional Overturning Circulation (AMOC), formed by warm surface currents flowing into high latitude locations in the North Atlantic, sinking, and forming cold deep currents that flow south through the Atlantic and can be traced throughout the world’s ocean basins. This system transports a significant amount of heat away from the Equator and Southern Hemisphere toward the high latitudes of the North Atlantic, where the heat is then released to the atmosphere. The cooled seawater sinks and flows southward to the South Atlantic, and then into the Indian and Pacific Oceans. This southward flow of deep water is compensated for with a return flow of surface and intermediate depth waters. Antarctic Intermediate Water (AAIW) is a major component of this return flow as well as an important source of both nutrients and carbon to the North Atlantic and a major “sink” for human-produced carbon dioxide. Despite the importance of the AAIW, the history of its flow into the North Atlantic has remained a source of uncertainty for oceanographers. In a recent study published in Earth and Planetary Science Letters, a team of researchers—including BIOS’s Bill Curry—used foraminifera from sediment cores to test the hypothesis that the AAIW’s flow into the North Atlantic followed variations in the strength of the AMOC. Specifically, the researchers measured neodymium isotopes in the fossilized shells of planktonic foraminifera with the goal of using those measurements to help reconstruct the past flow pattern of the AAIW. By looking at the neodymium isotope composition in the shells, then combining this with measurements taken from deep-sea corals and sediment leachates (liquid passed through sediments in core samples and collected for analysis), the team was able to confirm that foraminifera are, indeed, a useful proxy of past seawater neodymium composition. Then, by focusing on two different “cold events” in the North Atlantic during which the AMOC was reduced, they found that AAIW flow into the North Atlantic was reduced during the same periods, suggesting that past AAIW flow reflected the AMOC. Interestingly, a reduced AAIW into the Atlantic during North Atlantic cold events corresponds with increased flow of the AAIW into the Pacific during the same events—results that imply a “seesaw” flow of the AAIW into the Atlantic and Pacific.